﻿The 3 Ball and Chain is the ultimate fight stopper. 3 .58 caliber musket balls are connected by a total of 12" of braided steel cable which means the balls will never be more than 12" apart NO MATTER WHAT THE RANGE. This round hurls a total payload of 1 7/8 ounces at your target. 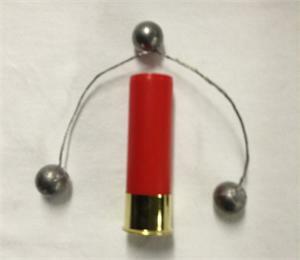 In addition to keeping the balls close together the steel cable creates its own wound channel upon impact giving you the ability to give your target an entry wound up to 12" across!!! This round cannot be shipped to IL, FL, MA, NYC, DC, HI, or AK.